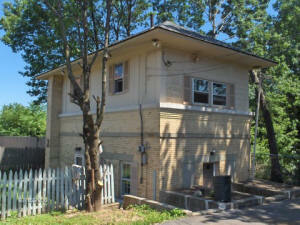 The former Central Railroad of New Jersey (CNJ) "QR" tower located in Roselle Park, NJ is now occupied by the author, a former (New Jersey Transit) railroad employee and lifelong railfan fan. The structure has been refurbished from its previous state to habitable condition, including the addition of a new roof. 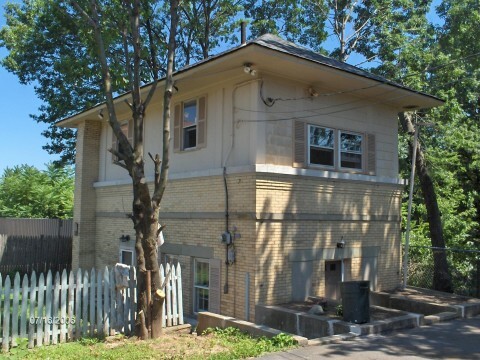 CNJ "QR" tower is now a railfan's residence. Photo by G. W. Rush. "QR" was the official designation of the tower when it first opened (date unknown). Towers were usually given two letter designations, some only one, and in later years a single syllable name, as identification. The employees would quickly invent their own names for the tower which would usually identify it with a geographical location. When it was open "QR" was known by the workers as Lorraine Tower, its location being between the Roselle/Roselle Park Station and Lorraine Station (Linden Road). Other CNJ towers included "WF" (Westfield), "XC" (Cranford), "GW" (Spring Street), "RU" (Eport), "FH" (Singers), "DY" (Bay Draw), "BV" (Bayonne) and "HY" (Greenville). Information from the track diagram above indicates that on QR's westward side it controlled movements to and from Cranford Yard from the east. Track 6 extended from QR westward through XC and came back out into track 4 at WF. On the eastward side, track 5, extended from WF, eastward through XC, and came back out into track 3 at QR, east of Roselle/Roselle Park Station. After QR closed in 1948 the passenger trains stored in Cranford Yard had to back west out of the yard through XC to Cranford Station, then run east to Jersey City. Prior to that they simply pulled east from the yard, making a station stop on track 6 at Roselle/Roselle Park, and then entered the main through QR. The abandoned tower lay vacant and, for the most part, open to the elements until the early 1970s, when a local electrician (somehow) bought it from the central and made it into a private residence. Nothing remains of QR's interlocking mechanisms, but there is still a crawlspace under the tower where the rods and such came through. I shudder to think of the poor signal maintainer who had to go down there to inspect and lube those things. However, the building itself is quite roomy inside with a 16 x 16 living room, huge arch doorway between the rooms, a kitchen of almost equal size, and two 12 x 12 bedrooms topside. There WILL be a model railroad in one of those upstairs rooms!